Regardless of your age, gender or religion, I bet you said “delightful” to finish the familiar holiday tune Let It Snow. Not everyone feels this way, but I am happy those holiday songs are heard over and over again. 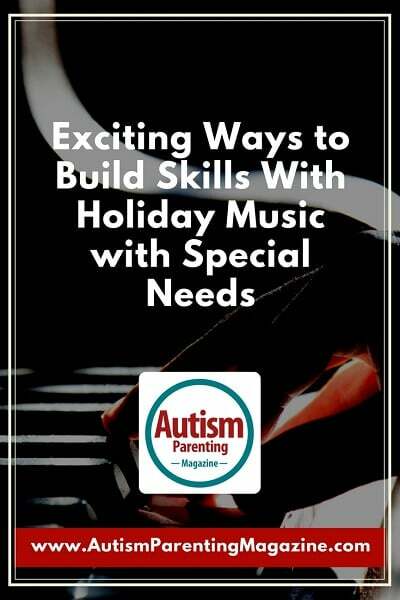 As a specialty music instructor for children with autism spectrum disorder (ASD), I can use the themes and familiarity of holiday music to build various development skills and have fun at the same time. Today’s popular music is rarely appropriate for children and often forgotten by the next season. The words and melodies to holiday standards, however, live on in our memories forever. I asked several of my students, “What do you think of when I say Christmas?” Each one answered, “Happy.” Whatever your beliefs, children are not typically focused on the religious significance of the holiday season. It’s all about fun, family, and the giving and GETTING of gifts. Leading up to the big day of happy feelings, children with ASD may face a season of anxiety. Routines change, and the holidays are full of social gatherings that may prove uncomfortable. Many sense the additional stress often faced by parents and siblings this time of year. Other children have difficulty managing time, and the anxious waiting becomes a strain. Why not use familiar holiday songs as tools for keeping things positive, managing time, changing activities, and inspiring thoughtful responses? Here are some techniques I use with my students. Music is something in our lives in which pattern changes occur naturally. The structure and time spaces within a song help the mind anticipate cues. A familiar song like Jingle Bells can be a fun tool for routine switching. For this exercise, all you need are jingling bells or a shaker instrument. Our goal is to make a change in the pattern of our movements without direct prompting. Posting the words to the song is helpful for some children, but for others, focusing on printed words can distract from the activity goal. After the abrupt stop, the singing of the song’s chorus, “Jingle Bells. Jingle Bells. Jingle all the way…” is our cue for a routine change and will employ a different beat. Instead of shaking on the fourth beat, we stop. So it’s 1 2 3 (stop) 1 2 3 (stop). 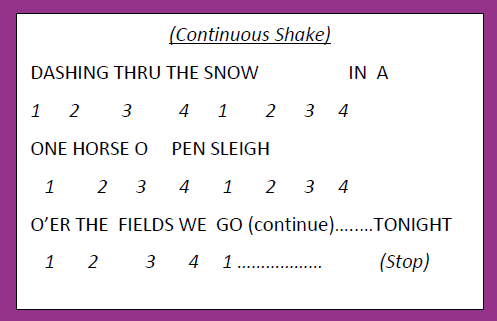 Three shakes, one for each syllable of Jingle Bells, then a one beat stop as seen below. Discuss with your child when to recognize the specific cues. For example, highlight the word “Tonight!” as the time to stop. It is also helpful for the instructor to be animated. Shake with broad movements so the “stop” becomes pronounced. With my students, it’s always OK to mess up and try again. After a bit of practice, the routine change will become anticipated, and you can have a holiday concert. Songs are great means for connecting time and physical motion. I find that if you give a child a single drum, the beat pattern is often erratic. Combining two or more body movements in a pattern helps to improve the connection between time and movement. Let’s use another familiar holiday tune to improve coordination and timing. The thumping 1 2 beat of the Jewish holiday song, Hava Nagila, is perfect for this. The two movements I like to use for this is a foot-stomp and a hand-clap to accentuate the beats. Start slowly. Talk to the child about keeping a steady syncopated beat. Stomp Clap Stomp Clap, then sing…. The initial goal is to keep a slow beat without wavering. If the child speeds up or loses time, it’s OK to start again. After this is accomplished, try it a little bit faster, then faster, then, as I like to say, Crazy Fun Fast! This may get erratic but usually ends in peals of laughter. Holding a steady slow beat might be a challenge at first. With practice, though, your child may find his or her rhythm can improve dramatically and this skill can last a lifetime. Make a list of a few items the child can use for responding. Try to inspire a spontaneous answer and let the child add a new gift that’s not on your list. It may be helpful to first sing some versus as an example. With practice, musical cues within the song can improve creative response abilities. I enjoy teaching guitar and music skills to ASD kids. I create songs with fun, appropriate lyrics, and easy-to-play patterns. These tunes get students enthused about their abilities and improve overall confidence. When Autism Parenting Magazine asked me to write an article about holiday music, it inspired me to write my own holiday song. But what could I come up with that hasn’t been covered already? So I did some “research.” I found that before he became Santa, Kris Kringle got a master’s degree in ABA at North Pole University. Aha! So that is why he keeps that list to reward the kids who are good. But we never heard about what happens to kids who are naughty. If you listen to my new song Santa’s Got a Snowball, you can find out, too. Of course, it was written to be easily played using only “open” strings on guitar. Listen to it on my website and maybe it will become a part of your family’s holiday music repertoire. David Meyers has written more than 100 songs, many of which are designed specifically for music learning. His unique brand of teaching includes Dave’s Ten Terrific Tunes which often can be played on the first day of lessons. David currently provides special needs music lessons in clients’ homes in the Westchester County, NY, area and at the Pied Piper Youth Theatre in Stormville, NY. He is also a music specialist for SPARC, Recreation and Therapeutic Services in Yorktown Heights, NY. David is a contributing member of the Children’s Music Network. Check out some of his songs on his website.